My Mother loved finding new churches to visit and she loved learning languages! Going through the few books of hers, that I own, I opened this Bible, initially assuming it was in Spanish, until I took another look. 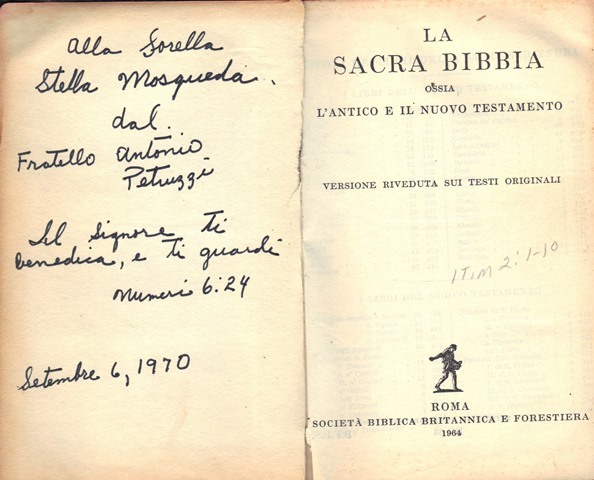 This is a Bible she was given during our time in Cleveland, when she found an Italian church for us to attend, because she wanted to master Italian! I must say what I most remember about that church are the outstanding chocolates made by at least one of the women who attended that church; I of course loved the food at the social events, how could I not! “I urge, then, first of all, that petitions, prayers, intercession and thanksgiving be made for all people— 2 for kings and all those in authority, that we may live peaceful and quiet lives in all godliness and holiness. 3 This is good, and pleases God our Savior, 4 who wants all people to be saved and to come to a knowledge of the truth. 5 For there is one God and one mediator between God and mankind, the man Christ Jesus, 6 who gave himself as a ransom for all people. This has now been witnessed to at the proper time. 7 And for this purpose I was appointed a herald and an apostle—I am telling the truth, I am not lying—and a true and faithful teacher of the Gentiles. This entry was posted on March 9, 2018 at 12:01 am and is filed under Archived Post, SlideShow, The Dialogue, The Reverend’s Ignacio and Stella Cooper Mosqueda Book Scholarship. You can follow any responses to this entry through the RSS 2.0 feed.